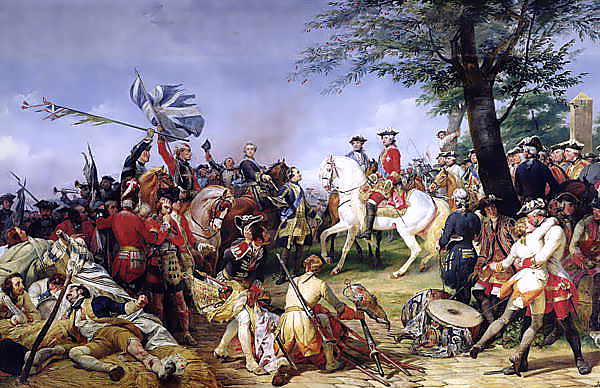 Above, ‘Battle of Fontenoy’ 1745, Irish soldiers are seen displaying captured British standards. The career of General Ross is remarkable for the light it sheds on the Irish military tradition and the manner in which the Irish Diaspora was in some sense framed by it. On the continent, during the Peninsular War, Ross both fought with and against Irishmen or men of Irish descent. Prominent in the Spanish Army, allies of the British, was General O’Donnell. In the long-standing tradition of the Wild Geese, Napoleon’s army included an Irish Brigade owing to the outstanding reputation of Irish soldiers in French service, not least at the Battle of Fontenoy in 1745, ‘regarded as the greatest of Irish battle honours’. At Fontenoy, ‘the Irish Brigade, composed of the regiments of Clare, Lally, Dillon, Berwick, Ruth and Bulkeley, as well as Fitz-James’ horse, had joined the French army after the British tore up the treaty of Limerick and effected the penal laws. They showed particular bravery in the battle, a sergeant of Bulkeley capturing an English flag, a colour from the Coldstream Guards, driving the British army from the field with the battle-cry, Cuimhnidh ar Luimneach agus ar feall na Sasanach!. Their role in this battle was commemorated on its 250thanniversary by the issue of a common design stamp by the Irish and Belgian post offices. A later battle cry, “Remember Fontenoy!” was used by 69th New York and the Irish Brigadeduring the American Civil War’. Ian Delahanty of Boston College has detailed how ‘I’ve found that Irish-American leaders (many of whom went on to serve as officers in the Union Army) before the Civil War were obsessed with the story of the Wild Geese and maintaining an Irish military tradition in America. Recruitment posters or advertisements would include phrases like “Remember Fontenoy,” and I know of at least a couple of widely-read Irish immigrant newspapers that ran both fictionalized and non-fiction stories of the Irish Brigade in France. These papers, like the Boston Pilot and New York Irish-American, were hugely influential at the time of the Civil War, and they used the Irish military tradition in America (whether in the Mexican American War, War of 1812, or especially the Revolution) as a way to rally Irish immigrants to the Union’. 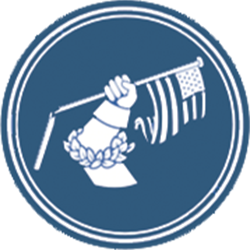 The most famous of these US Civil War regiments was the New York based ‘Fighting 69th’ with its battlecry of “Faugh a Ballagh;” which is the Gaelic for “Clear the Way.” Interestingly, to this very day the Royal Irish Regiment in the British Army uses the same battlecry , “Faugh a Ballagh”. As for Napoleon’s Irish Brigade, it saw service in the Walcheren campaign in Holland in 1809 where Robert Ross served with the XXth Regiment. When the Napoleonic wars concluded with Waterloo part of the price of defeat was a British insistence that the Irish Brigade should never be resurrected in the service of France. Primarily, though, by the early nineteenth century, the degree to which Irishmen contributed leadership and manpower to the British Army was truly remarkable. Figures for 1830 show that at a time when Ireland constituted 32% of the population of the UK, Irishmen accounted for 42% of the British army – ‘there were more Irishmen than Englishmen in the British army’. Irishmen commanded at the very highest levels, not least Lowry Cole who memorably commanded the 4th Division during the Peninsular War in which Ross served. And of course the Iron Duke, Wellington, was an Irishman – and a childhood playmate of Ross. 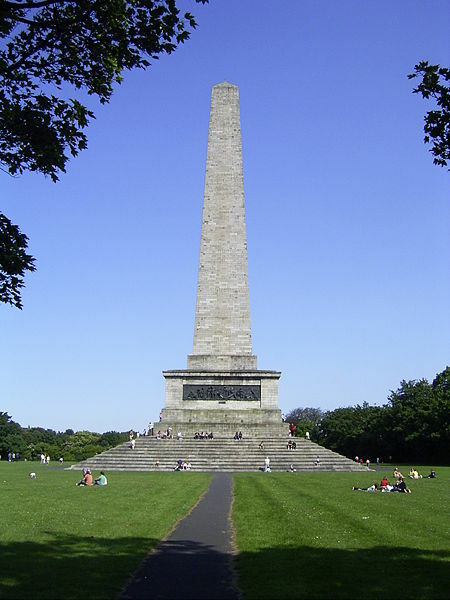 Above: The Duke of Wellington Monument, Phoenix Park, Dublin. Note the similarity to the Ross Monument in Rostrevor, County Down, Northern Ireland. For some contemporaries in Britain, the sense of loss when Ross was killed at a relatively young age at North Point near Baltimore in 1814 was amplified by the reckoning that he was destined to become a ‘second Wellington’. Ross cut his teeth commanding the XXth Regiment, earning battlefield laurels at Maida in southern Italy in 1806 and later during the ‘Retreat to Corunna’ in 1808 when the XXth distinguished itself in the rearguard. Among its number were many Irishmen, including large numbers who were recruited after disease devastated its ranks during the Walcheren campaign, even though it had not fired a shot in anger. The so-called ‘Waterloo priest’ was among their number. And when Ross led his small army against Washington in 1814, his four regiments were commanded by Irishmen: Colonels Patterson, Thornton and the Brooke brothers (ancestors of Viscount Alanbrooke), Francis and Arthur. (There is no evidence though that Francis Brooke was part of the expedition to the Chesapeake under General Ross. The 4th Regiment of Foot at Bladensburg and North Point was commanded by Major Alured Dodsworth Faunce, whose mother Bridget was the daughter of Mr E. Nugent of Dublin). A Military History of Ireland (Cambridge, 1996), p.299. E.M.Spiers, ‘Army organisation and society in the nineteenth century’ in Thomas Bartlett and Keith Jeffrey eds,A Military History of Ireland (Cambridge, 1996), pp 335-7.